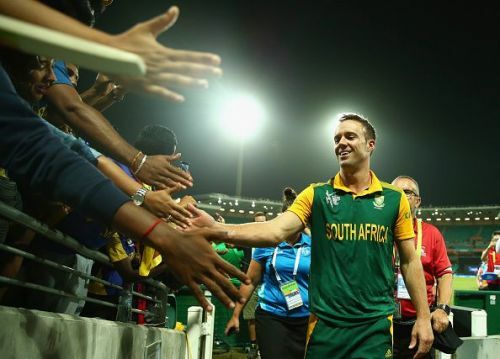 AB de Villiers failed in leading South Africa to their maiden World Cup victory but he successfully captured the hearts of millions who saw the event. His outstanding performances became unfruitful in the end and got many viewers were left heartbroken. The 2015 World Cup Proteas captain notched up a total of 482 in 7 innings he batted with an average of 96.40 and an outstanding strike rate of 144.31 becoming South Africa's top run-getter in the tournament. His 162* off 66 balls with seventeen boundaries and eight sixes at a strike rate of 245.45 against West Indies in the Sydney cricket ground was his best at the event. It was undoubtedly a showcase of his superhuman abilities. Mr. 360 showcased the best version of himself during the master class tournament. Everyone expected him to perform during the 2019 World Cup. Shockingly, he announced a retirement while being in his absolute prime a year before the upcoming edition of the marquee event.